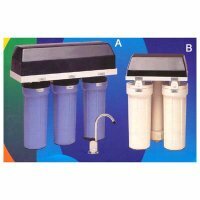 B: Reo-Pure Series - 10, 20, 30 GPD Reverse Osmosis 3-Stage System - D. I. Engineering Co. Ltd. Positive, Automatic 6-Cycle Regeneration Programe Times, performs and resets (1) upflow backwash (2) downflow brining (3) downflow slow rinse (4) upflow rapid rinse (5) brine tank fill and (6) downflow service. Efficient 6-cycle regeneration provides maximum salt efficiency and minimum w3ater consumption. Rugged Premium Quality Construction Features for domestic and light commercial applications; strong, durable solid brass valve body. Quick-Connect Mounting Valve mounts with just two screws at the tank, two at the inlet and outlet ports. Solid Brass Construction Quality brass valve body assures long life with no cracks or leaks. Quick Accurate Adjustments For all water conditions speed field installation, reduce errors. Fleck Model 3600's Exclusive Brining System Timed brine making insures consistent salt usage every regeneration cycle; keeps salt consumption at a minimum. 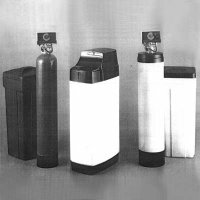 Energy Efficient-Uses only line pressure. Money Saving - Replaces expensive bottles water. Better Tasting Water - Removes unpleasant tastes and odors. Better Looking Water - Crystal clear water and sparkling ice cubes.